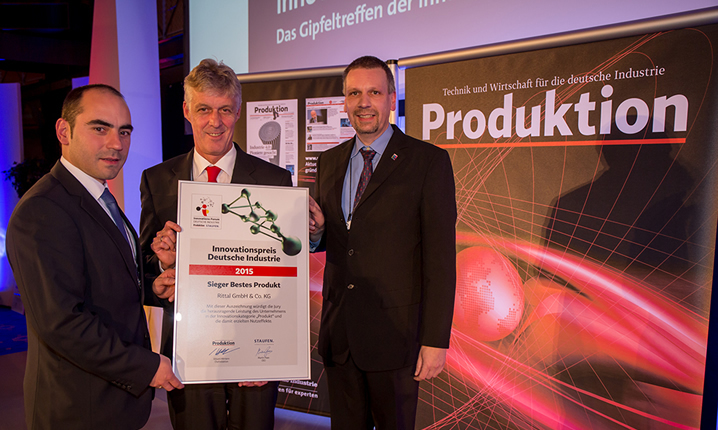 German Industry Innovation Award: Blue e+ is the best product in 2015! 05.11.2015. The new generation of Blue e+ cooling units from Rittal has received German industry’s Innovation Award for the best product. The jury from “Produktion” magazine and Staufen AG management consultancy, who awarded the prize for the first time this year, was impressed by the high energy efficiency, intuitive operation and the Industry 4.0 readiness of the cooling units. The German Industry Innovation Award acknowledges outstanding developments that boost Germany’s Mittelstand of mediumsized companies in particular. "To develop this new generation of devices, the company has fundamentally questioned and rethought many traditionally used methods and principles,” continued the jury’s assessment. Given the energy savings of 75%, the development has a huge impact on the approx. 2 million systems in which enclosure cooling units are in use. 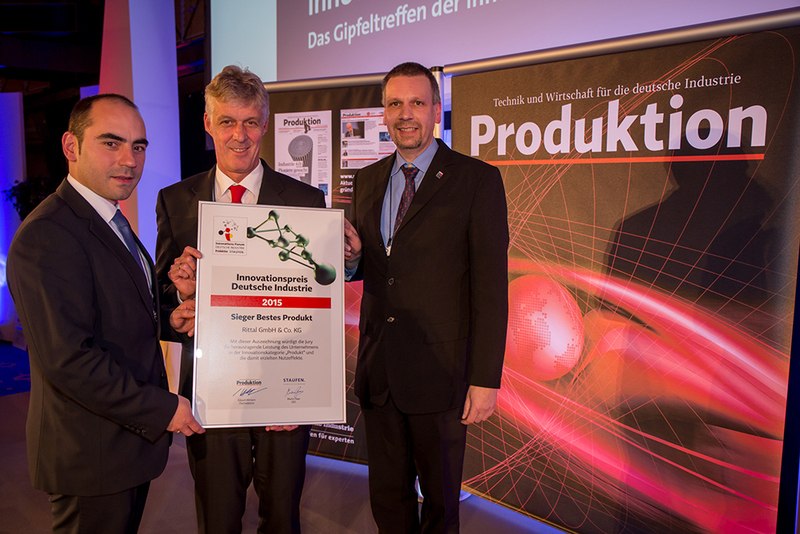 “Rittal earned this achievement award in the category Best Product,” said Staufen director Martin Haas. The new “Blue e+” generation of cooling devices for enclosures was presented to the public for the first time at the 2015 Hanover Fair – a quantum leap in terms of energy efficiency. This is because Rittal’s innovation is equipped with a completely new technology that consumes around 75% less energy, as tests at a well-known automobile manufacturer have shown: The device’s hybrid technology functions through the combination of a compressor cooling unit and a heat pipe. The compressor is only used when the passive cooling is no longer sufficient. Besides this, the devices can be operated flexibly in all standard grids, thanks to their multi-voltage capability. Standardised communication interfaces permit connection to Industry 4.0 structures. The German Industry Innovation Award was first presented in 2015. At the Innovation Forum in Stuttgart, Produktion and Staufen AG rewarded outstanding innovations by medium-sized German companies. This followed a multistage assessment process: Companies can apply for the innovation award with business models, products, processes or structures. Staufen consultants examine the innovations in terms of economic impact, benefits to society and sustainability. In an on-site audit, they then analyse the companies’ innovation systems. Only then is the final decision made as to who are the leading innovators among the German SMEs, and who will be recognised at the Innovation Forum. The event’s patron is Winfried Kretschmann, Minister President of Baden-Württemberg. Image: Proud winners: Dr Thomas Steffen, Rittal’s Managing Director, Research and Development (m.), Heiko Holighaus, Director of Pre-Development (r.) and developer Juan Carlos Cacho Alonso (l.) accepted the German Industry Innovation Award.